UKSEDS are pleased to announce that their joint bid with the University of Leicester and the National Space Academy to host the 3rd Symposium on Space Educational Activities in September 2019 has been selected by the European Space Agency. The Symposium is aimed at students and educators interested in space related educational activities, particularly at university level, but also at high-school level. The three day event will enable discussions of current and future opportunities across Europe, and give students who are currently, or have previously been involved with space educational activities, a stage to showcase their exciting work. University students and young professionals from around the world will come together to share their experiences of participating in space educational activities. Some projects have lead students to designing and operating real hardware in space, while others have been purely educational. By discussing scientific and technical results and reflecting on the educational benefit of such activities, it is hoped that participants will gain inspiration on the range of space educational activities they may become involved with. UKSEDS members will have the fantastic opportunity to showcase activities they have been involved with at their universities, such as UKSEDS’ National Rocketry Championship and Olympus Rover Trials competition. 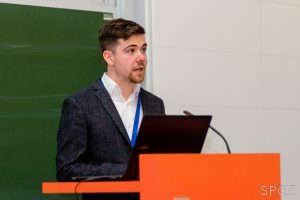 At the 2nd Symposium, UKSEDS former Vice-Chair Rob Garner presented a paper on UKSEDS’ insights into removing roadblocks in the UK’s space skills pipeline. Rob Garner presenting at the 2nd Symposium which took place in Budapest, Hungary, in April 2018. Equally important for the symposium, is the opportunity it will provide for educators (both curricular and extra-curricular) to share their experiences in providing and supporting space educational activities. Hands-on activities and specialised training and learning opportunities are crucial in the preparation of the next generation of space scientists and engineers, and the networking opportunities at the Symposium for educators in this area will enable discussions and development of such activities to further improve their effectiveness. Visit ssasymposium.org for more information. UK Students for the Exploration and Development of Space (UKSEDS) is the UK’s national student space society. For over 30 years we have been supporting students and young professionals across the country by running events, providing resources, and teaching them new skills. Our alumni work throughout the global space sector in government, industry, and academia. ← UKSEDS is looking for a new Exec member!